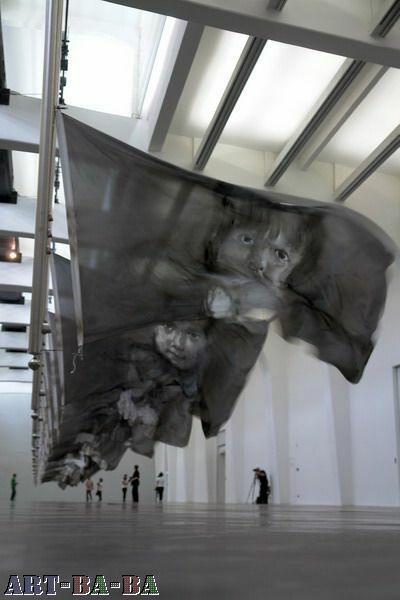 Yan Peiming "landscape of childhood"
UCCA presents Landscape of Childhood, an exhibition by major artist Yan Pei-Ming. Following Les Funérailles de Monna Lisa exhibition in Musée du Louvre, Landscape of Childhood will stand as a surprising show and the first time Yan Pei-Ming has produced a show without canvases by experimenting with installation. "Yan Pei-Ming has become the ultimate artist portraying the iconic characters of our time. His work stands as a major reference on the international contemporary art scene and this show should remain a milestone in history since it features the portraits of the icons of tomorrow: the next generation of Chinese citizens framed into an empty landscape, the future", Jérôme Sans, UCCA Director and co-curator of Landscape of Childhood. 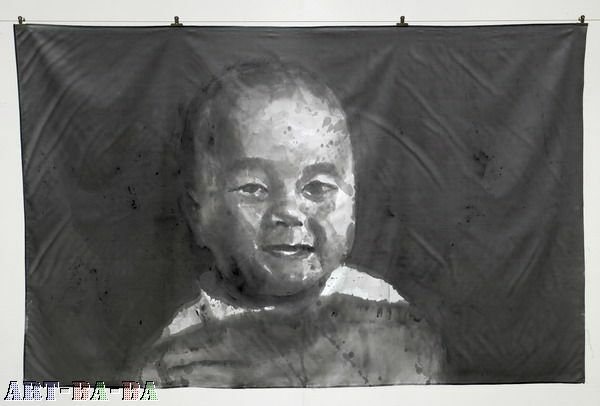 One huge landscape directly painted on the wall of UCCA's Big Hall frames a series of painted flags representing portraits of 34 Chinese new born children. Imagined as an abounding walk trough faces and urban views, the exhibition powerfully conveys Yan Pei-Ming's intentions and gives the audience an opportunity to discover a vision of our world in a landscape of crisis and beyond. Yan Pei-Ming is famous for his monochromatic large portraits executed in either black and white or red shades. "I have never felt it necessary to put some things around the persons; I just want to draw portraits." 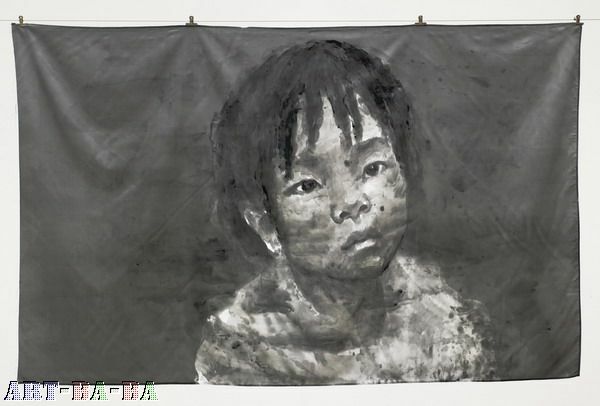 "Yan Pei-Ming's portraits, furiously and quickly executed with a strong, large brushstroke technique, reflect the artist's concerns on social conflicts and international politics and present his ongoing concern for problems of universal human nature", Guo Xiaoyan, UCCA Chief Curator and co-curator of Landscape of Childhood. Born in Shanghai in 1960 and living in Dijon, France, since the early 1980s, Yan Pei-Ming has always been interested in the concepts of individuality and anonymity expressed in the portraits and landscapes he paints. He has been one of the first Chinese artists to settle and build his career abroad. Yan Pei-Ming has taken part in numerous group and solo shows. The artist's many prestigious group shows include Villa aperta, Villa Médicis, Rome, Italy (2009), Libertad, Igualdad, Fraternidad, La Lonja de Zaragoza, Saragosse, Spain (2009), Other's World, MoCA Shanghai, Shanghai, China (2008), The Gallery, David Zwirner, New York, USA (2008), Yan Pei-Ming, Gu Dexin, Yang Jiechang, The Red Mansion Foundation, London, United Kingdom (2007), Size Matters: XXL, Hudson Valley Center for Contemporary Art, Peekskill, New York, USA (2007),The unhomely, Phantom Scenes in Global Society, 2nd International Biennale of Contemporary Art, Seville, Spain (2006), A propos du Lingchi (supplice des 100 morceaux), with Huang Yong Ping, Musée Denon, Chalon-sur-Saône, France (2004), Moi - Autoportraits du xxe siècle, Musee du Luxembourg, Paris, France ( 2004), New Zone-Chinese Art, Zacheta National Gallery of Art, Warsaw, Poland (2003), The Venice Biennale, Italy (2003 and 1995) and Lyon Biennale, France (2000 and 1997). On the occasion of the presentation of Yan Pei-Ming: Landscapes of Childhood, UCCA intends to go beyond the usual art event. Partnering with another Non for Profit institution, The United Foundation for Chinese Orphans, we wanted to draw our audience attention towards these orphans and children whose families can not afford medical healthcare. 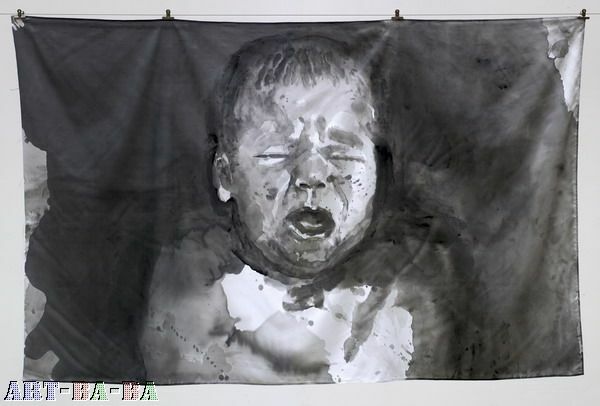 With the images of Chinese newborn babies' portraits presented in the show, UCCA and The United Foundation for Chinese Orphans hope to raise wider support to provide adequate healthcare to all children, especially those abandoned and coping with mental and physical disabilities, living in China. This installation being very noisy, the staff has to wear earplugs.